If there’s one game that I think everyone has played, it’s Solitaire. Whether it be with physical cards or once on a Windows PC, I’m sure we’ve all sat there and played this once addicting game. I know I still play it from time to time when I’m bored at the office and while the game is pretty timeless, having a new way to play it wouldn’t hurt. That’s where Sage Solitaire comes in. Sage Solitaire is a new way of playing traditional Solitaire which combines elements of Klondike and Poker. 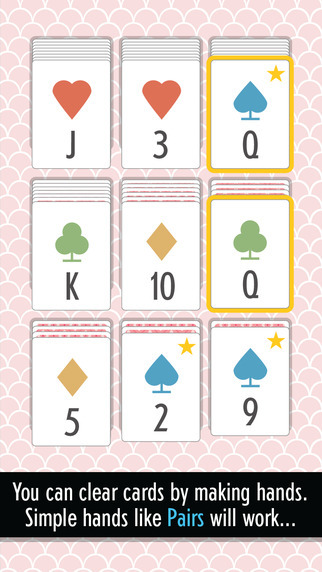 Sage Solitaire was created, according to the developer, to be played exclusively on mobile devices. It would be a game that would be easy to play one handed and one in which the cards were large and didn’t require a magnifying glass to see. 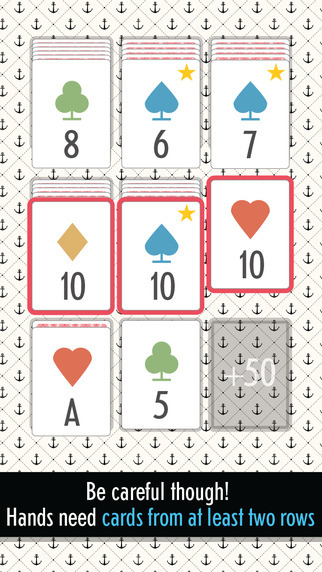 What makes this version of Solitaire different is the gameplay. 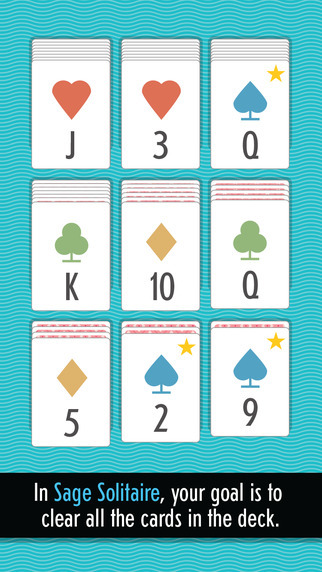 Unlike in regular Solitaire, Sage Solitaire allows you to create groups using basic Poker style hands. That means instead of grouping them by number order, you can make groups of pairs, straights, full houses, and flushes. The only limitation is that matches must be made on different lines. That means you can’t make a pair for instance if both cards are on the same line. When you are able to make groups, those groups are removed from the board. Your ultimate goal is to clear the board entirely. The secondary goal is to get a high score. 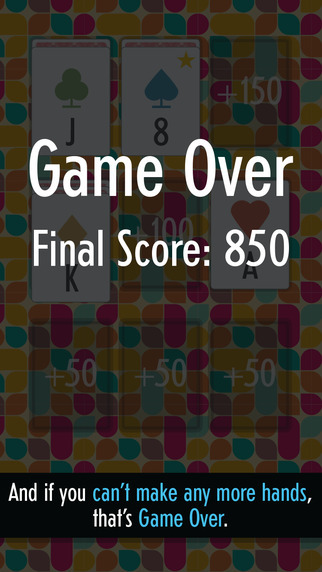 Like regular Solitaire, it is possible to get stuck and not be able to clear the board. There’s no way to undo a move, but the game does allow you to trash up too two cards. That means if you don’t see any hands you can make, try your luck trashing a card and hope the next card that comes up is something you need. Sage Solitaire from zach gage on Vimeo. 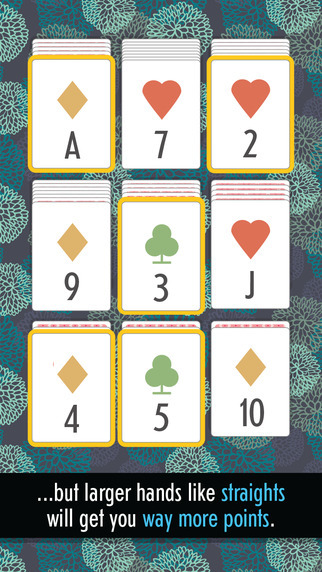 Sage Solitaire comes in a free version, which includes the base game. The full version of the game can be unlocked via an in-app purchase and includes features like leaderboards, themes, wallpapers, and the addition of two other modes of play. Unlocking the full game is $2.99. However, you can easily enjoy hours of gameplay with the free version. It all depends on how much more you want. Compatible Devices: Requires iOS 6.0 or later. Compatible with iPhone, iPad, and iPod touch. This app is optimized for iPhone 5, iPhone 6, and iPhone 6 Plus. Klondike is a great game when all you have is a deck of cards, but you have more than that, you have the computer phone of the future! Our phone screens aren’t the size of a table (yet), so why do we have to play Solitaire games designed for tables? Isn’t it time we had a Solitaire game where the cards were big enough to see and easily touch? Shouldn’t there be a Solitaire game light enough to play casually, yet deep enough for swapping strategies with friends? I hope you enjoy Sage Solitaire.